Selling techniques on how to prospect and get sales referrals to increase your sales results or grow your small business. Click around some of the ideas and prospecting tips, and put together your own action plan to give yourself a constant flow of sales opportunities. Referrals from others are very powerful sales prospecting tools. Imagine if you mentioned to a friend that you were looking for a certain product or service. Your friend recommends you contact someone they have used. You automatically feel a sense of trust. Your friend must be happy with the service and the deal they received. There is security in recommendations from people that have had a good result. Your friend may not even have bought from the company. But they have heard, or seen something, that has given them the confidence and reasons to recommend the seller to you. What selling techniques are you going to use to give your customers the confidence and reasons to tell their friends about what you can do for them. Are we getting the best deal? Will the after sales service live up to the promises made? And remember it doesn’t have to be a customer that recommends you. Have you ever told a friend about a shop, or a business, even though you haven’t bought anything from them. You have a sales process. A pattern you follow with your potential customers that takes you from your first introduction to closing the sale. ...If you want to see the sales process I use with my sales teams, that works for all types of field, direct, and retail sales, click on Sales Training and use proven selling techniques to build a money generating sales process..
Action 1: Identify the customers and prospects that could recommend you to other people. Think about your business and the people you meet with. Will it only be satisfied customers that recommend you, or could prospects that haven’t bought yet have a reason to tell others about you? Try these selling techniques that are used by many other professional sales people to get referrals and sales recommendations. Take some paper, or open a word document, and write a quick list of the type of customers, or prospects, that could recommend your business. Will your business benefit from family and close friend referrals. Do you target local business, and do you want the word spreading by local people. Is there a certain type of customer you are targeting and will they be talking to other people that are just like them. When this steady supply of sales peospects starts rolling in make sure you have a great sales appointment call to make the most of them. 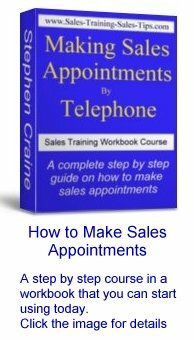 To see the appointment call training I use with my sales teams click the image above. I know a car dealership that specializes in selling to families. It’s a great selling technique that benefits the business and the customer. Mothers and Fathers bring in their sons and daughters, and their grand children. It’s been going on for generations. There is a trust that has been built so strong that it has turned into family traditions. Now write down your ideal targets for spreading the marketing message about you. Be creative and let your mind make new connections. Ask yourself. Who do you want to recommend your business to other people. Who is your target market? I work with some sales people, and even companies, that don’t have a corporate image. They don’t have a marketing message that they can project to potential customers. Some think that they can attract all potential customers in their market place. That would be very unusual, no matter how good your selling techniques are. As an example consider some of the car showrooms in your area. Would the same potential customers be attracted to all the showrooms and dealerships? Take a prospect looking for a great status symbol. Or, first class customer service, trouble free motoring, luxury transport, and a car that shows their wealth. They would be attracted to the high end showrooms. Showrooms with an image that says, We look after our customers. Would they be attracted to the car supermarkets that give excellent value for money and project an image of affordable cars sold on finance deals? Do you have an image, a message to potential customers. One that targets a section of the market? For more ideas click on the link and open a new window on building an image with Professional selling skills then come back to the Selling techniques here. Here’s a great example of targeting specific customers as referrers, and the message you want them to pass on. A salesman that sells recycling solutions to businesses, gets a constant flow of prospects phoning him. All his customers see him as a person to contact with all their technical recycling problems. He projects the image of an expert. He is up to date with all legislation and has contacts throughout the industry. Many times he gives information and solutions that do not benefit him at the time. If he can’t provide what the prospect wants he will recommend companies that can. His customers pass his details on to other potential customers and they take his details with them when they move jobs. Back to your word doc, or piece of paper. Write your ideas on the message you want recommenders to communicate. If you have an image and a message that you project to customers, link it to the message you want recommenders to spread. Consider your target market. Who are they, what do they want from you, what do you offer them. Do you have a unique selling point, or a major sales proposition as part of your selling techniques. Are you an advisor on products or services? Do you want people to say, you are the cheapest, the best value, give great after sales service, friendliest, most professional? What are your selling techniques, your sales angle into the market? You know who you are going to target as people to recommend your business to others. You have decided on the message you want them to communicate. Now consider how you will put these selling techniques into action. The first step is to deliver the message about your business to your target recommenders. You must convince them before they will convince others. Go through a typical sale with a person that could carry away your sales message. From your first introduction to the customer, to the after sales service. As you see in your mind the sale progressing, write down all the places you could communicate your message to the customer. List the phrases you will use to place that recommendation message in their mind. In your introduction to the customer you will probably include a possible benefit the customer could get from doing business with you. Make this benefit spell out the message you want them to pass on to others. Whatever type of sales role you are in get your message across throughout your sales process by including it in your selling techniques. Because we are . . . your Message . . . we can give you . .
As the . . .your Message . .. you will get . .
Add to your selling techniques examples of how other people have recommended you to friends, colleagues, or family. Tell them a very brief story about how you get regular recommendations. Explain what it is referrers have said about you. If you have written feedback from happy customers make sure you get them into your sales pitch or marketing literature. Add to your selling techniques list the phrases and sentences you will use to embed the idea of referrals in the mind of your customers. Think of this as a secondary objective of your sales pitch. Even if you don’t get the sale today you still want this customer to recommend you to other potential buyers. If you do get the sale, then what a great Sales Buzz if you get referral sales afterwards. Is there a benefit for the person recommending you to their friends and colleagues? What can you offer to the people that refer you to others, or give you a referral? A full blown affiliate scheme, where you pay a percentage of any sales that come from their referrals. To just a phone call to say thanks. For B2B sales you could have a formal or informal referral system with non competing businesses that target similar prospects. Customers that refer you can also get the satisfaction that they have been able to help someone else to find the same benefits they received. Your relationship with the referrer will grow stronger. These selling techniques help tie in customers to you. If they are recommending you to others they are not likely go elsewhere to buy. Many sales professionals I have worked with include benefits of referring potential customers in their basic selling techniques. As part of their sales pitch they tell customers how prices will remain competitive if they continue to attract more customers in the local area, therefore keeping delivery cost down. So the customer can see a direct benefit from recommending the service to local businesses, and giving the sales person referrals. So now add to your list all the possible benefits that a referrer can get by recommending you to others. Include both direct and indirect benefits. What can you do to increase these benefits? Consider selling techniques to make your customers think about you, your message, and the benefits they can get from telling others about you. You now have a plan to bring in warm sales leads from recommendations and referrals. Put it into action alongside your existing selling techniques. A few chosen phrases, and some additional marketing material. Remember the Buzz you feel when you close a deal or smash through another sales target. That electrifying emotional high when you win an important sale, and get the commission. 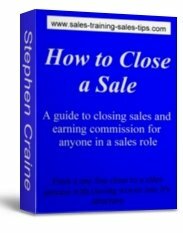 When you take the free sales training newsletter you get a free copy of Need to Close Chains. 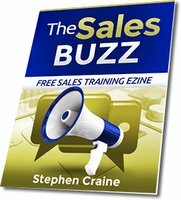 A quick-fire sales training technique that builds new neural pathways to give you practical selling skills, and control over your sales motivation. 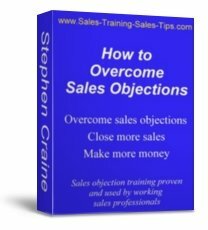 Follow the link and see what you can have by clicking the free newsletter sales training and get your free copy of Need to Close Chains. For more sales prospecting tips and ways to increase your list of potential customers, go to the Prospecting tips main page and click around the links. 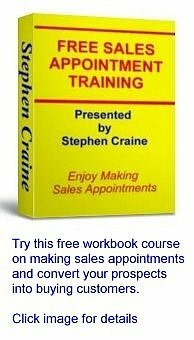 For a new topic on sales training for all sales people and small business sales enterprises move to the Sales Training Sales Tips home page.